It’s been two months so far that I’m out in Los Angeles and it has been more than anything imaginable. I am currently interning at Black Box, a music marketing company, and we work with artists including Bridgit Mendler, Janelle Monae, for King & Country, Jason Mraz, and many others. 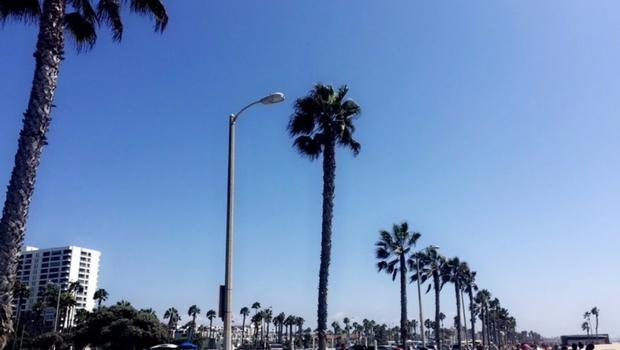 The quintessential view of Los Angeles: palm trees! One of the main reasons I was so interested in interning at Black Box is because I felt the internship would give me a very clear idea regarding how an artist is marketed, how their single is marketed, their EP, and their tour. Wanting to pursue a career in the music industry, with a goal of opening my own company and being a successful artist manager, I figured these particular marketing skills would be quite useful. I have been working on multiple tasks since I’ve started my internship, and that’s what I love! Although I do have a main project to focus on, I’m learning a variety of tasks by different manners: some by actually doing, others simply by listening and observing. I am also impressed with the way the internal team functions. We have team meetings where we Skype with team members that aren’t based in LA and I have to say, those meetings are my favorite. I just love when everyone comes together to share ideas and discuss the topic at hand. Through my internship, I've also done some pretty cool things so far, like attend the opening of one of the new Facebook/Instagram offices here in Los Angeles. Both Facebook and Instagram are platforms that I use on a daily basis, so visiting the office was surreal. I even went into their Facebook Live room and created a Facebook Live with one of my coworkers. All of my family and friends back home were able to see me, which I thought was awesome: my first Facebook Live and what better location than at the Facebook office itself! As part of my internship, I also attended a concert for one of the artists we work with, Beartooth. They performed at The Regent in Downtown Los Angeles while on their Aggressive tour, and it was the first rock show I've ever attended. Giuliana makes an appearance on stage! Outside of work, I'm taking full advantage of the Los Angeles' culture. In my eyes, it is the greatest city in the entire world, and the one where I fit in the most, so I make sure to do what I love while I'm here. A few weeks ago, I was invited to an event at The Novo in Downtown Los Angeles. The Novo is a part of a complex called LA Live, which includes a bunch of restaurants, the Microsoft Theatre, and the Staples Center. As I was walking around, I noticed a big sign that said "DNCE and Demi Lovato" with an arrow pointing to the left. DNCE and Demi are two of my favorite bands/singers. I couldn't believe that I didn't know about the event beforehand and that they were both performing right where I was. I scouted the scene and noticed a big fenced-in stage outside. I thought to myself that after my event, I would come outside and at least listen to the performance. Fast forward a few hours. I left the event at The Novo and could hear DNCE singing "Cake by the Ocean" - they were finishing their set. I was waiting near the fenced area to hear Demi, who was performing next, when I heard an event employee announce, "Anyone who wants to see the performance, just walk right around the corner - we have extra free tickets." And not only did I get in, but I somehow got escorted to the front by security. Now, give me an example of anywhere else in the world where something like that would happen. It ended up being one of the best nights of my life, just because it was really so spontaneous and unexpected! 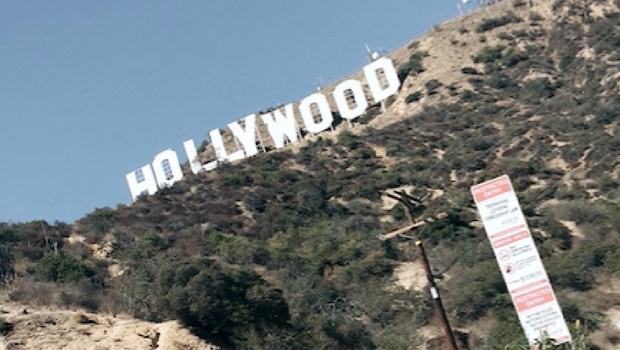 A view of LA's famous Hollywood sign. Another thing I've done in LA is hike up to the Hollywood sign. For me, that sign is extremely significant; when I see it, it means that I am living my dream, that I have worked hard enough and that my efforts have paid off. I feel lucky that I can walk outside and see the sign from a distance every morning, but it's a whole different ball game when you're so close that you feel like you could reach out and touch it (and the picture doesn't do it justice). Giuliana at the set of Lip Sync Battle. 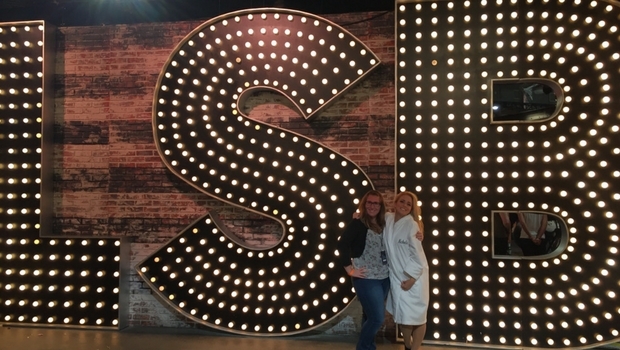 When I think of LA, I think of concerts and show tapings, and since I'm pursuing a career in the music industry, I enjoy those events most; for instance, I attended a taping of Spike's Lip Sync Battle. I also took a short trip to Las Vegas after scoring tickets to the taping of the iHeart Radio Music Festival. It was my first time traveling somewhere completely alone, and going into the unknown too. I took a bus to Vegas. I then walked the Strip on Saturday morning, attended the show at night, and headed back to LA on Sunday morning. I was a little bit scared, of course, who wouldn't be? At the same time, I was so proud of myself for having done that on my own. The festival featured performances by Britney Spears, Backstreet Boys, Florida Georgia Line, Usher, and Hailee Steinfeld, amongst others - it was truly incredible! Next up, I also attended A21's third annual Walk for Freedom. It's a worldwide initiative that took place on October 15 to raise awareness on the issue of human trafficking. The founder of A21, Christine Caine, was even present, making the event even more incredible. Over 300 individuals attended and we all walked the streets with a black piece of tape on our mouths, in a single file. We got many stares, so hopefully the goal of raising awareness on the issue was accomplished! 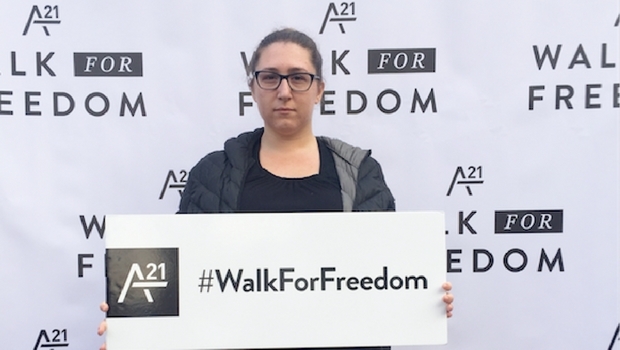 Giuliana attends the A21 Walk for Freedom. I've done so much already, and I'm only two thirds through my internship. I'm looking forward to seeing what the last third will be like! 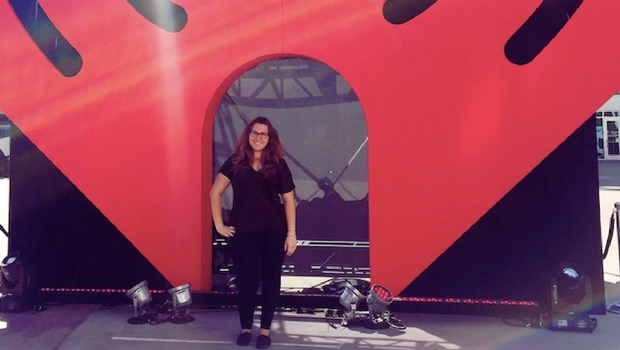 Check out the Intern USA website to find out how you can have an adventure like Giuliana's! Giuliana is a participant on InterExchange's Intern USA program. She has been interning with Black Box Media in Los Angeles.